The architecture of the baptistery, as a location for the baptismal rite, has a specific significance within the history of building. In ancient times the term was related to a basin, pool or other place of bathing. The (Latin) term baptisterium pointed originally to a vessel, which contained water for baptism. A circular bath at Pompeii also carried the name of baptisterium as given by Pliny. 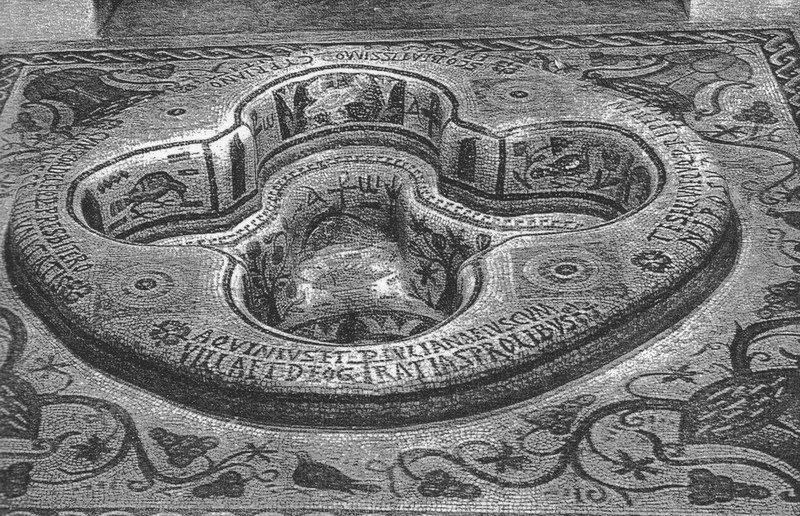 The earliest extant baptistery was found in the Roman catacombs. In the Early Christian Church, the meaning included both the baptismal font and the building in which it was placed. This building could be either outside the main church, attached to the church in an adjoining room or part of the main hall. The Empedocletian element water is the fourth and last undividable unit in the sequence fire, air, earth and water. Our present (quadralectic) interpretation places the element of water in the Fourth Quadrant, paying a tribute to the multiplicity of the visible. Water is always related to quantity and often to movement as well. From a biological point of view, the watery is our primeval environment. We are born in the all-embracing presence of fluid, even before air could feed our lungs. Therefore, our invisible roots are closely related to water, and the act of baptism is just a remembrance of that early stage. The architecture of baptisteries and fonts often had a symbolic meaning, which was expressed – probably more than in other forms of building – in a numerological language. DAVIES (1962) studied the architectural setting of baptism and noted that the earliest baptisteries of the third and fourth centuries were square or rectangular, with or without an apse at one end. They can be found in Egypt, Greece, North Africa, Palestine and Syria and persisted until the seventh century. In other areas, like France and Italy, the quadrilateral outline changed into a round or octagonal plan from the middle of the fifth century onwards. About four hundred of these baptisteries of the Early Church, dated from the third to the seventh century, are known (KHATCHATRIAN, 1962). The history of the Lateran baptistery in Rome reflects these modifications upon a single site (fig. 42). The original baptistery from the early fourth century had a square outline. It was enlarged around 350 AD and transformed into a circle with eight columns along its interior walls. The structure became known as the Constantinian baptistery. 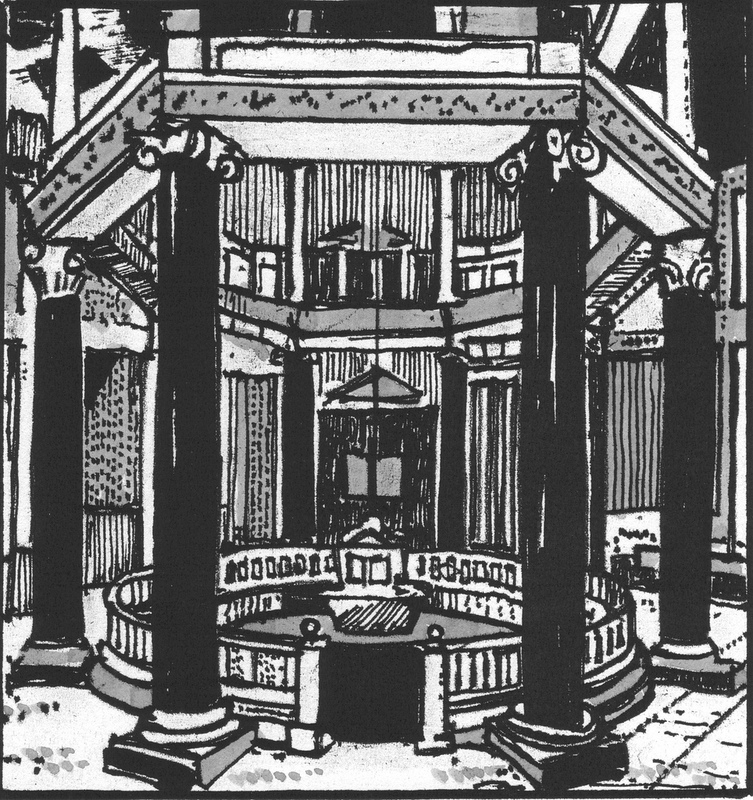 A pronaos or porch was added in 432-440 AD under the inspiration of Pope Sixtus III and the circle was changed into an octagon. A domical vault covered the center room until 1632. The building became an example for many similar round, cylindrical halls or octagonal buildings. Fig. 42 – The baptistery of St. John Lateran in Rome was one of the earliest on record, dating from the first decade of the fourth century. The baptistery acted – after several modifications – as an example for similar structures. The original structure was square. The transformation to the Constantinian baptistery of the middle fourth century added circular elements and Sixtus III introduced the octagonal in the years 432 – 440 AD. 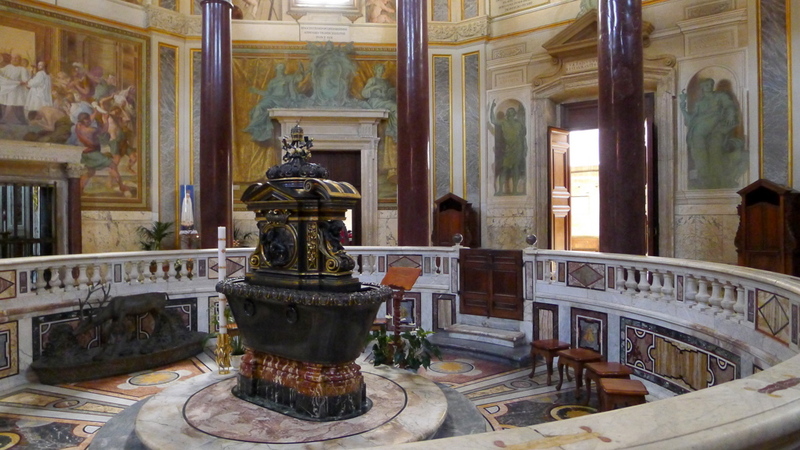 The interior of the baptistery of St. John Lateran in Rome (Photo: Marten Kuilman, May 2014). 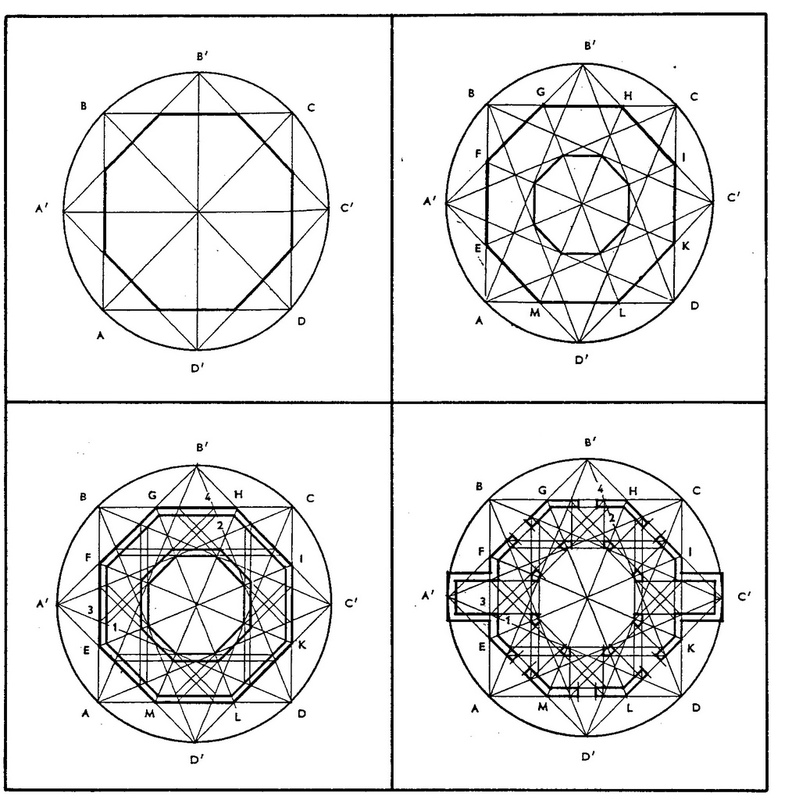 Eight is the first cubic number (2³) and – according to Martianus Capella – just like the number six a complete number. The number eight has this property both in a geometrical and arithmetical sense. Already the early Christians used an octagonal font because it pointed to resurrection and eternity. Gregory the Great knew the eastern symbolic meaning of eight as a connection with eternity (‘Moralia’, XXXV, viii, 17) (LADNER, 1992, p. 104). There is, for this very reason, a close relationship (in architectural treatment) between baptisteries, martyria and funerary monuments. It was on the eighth day that Jesus rose from the dead and ascended to heaven. The theme of death and resurrection was related to baptismal regeneration. DAVIES (1962) noted a development in the building of baptisteries, although with regional exceptions, from an initial square (quadrilateral) plan (fourth century) to an intermediate circular shape and finally (in the fifth century) to an octagonal outlay. This development was particular visible in Italy and (southern) France. The quadrilateral form remained almost unchanged in Greece and its islands (Samos, Paros, Rhodes, and Cos). Asia Minor, Syria and Palestine followed the Hellenistic trend and preferred the square or rectangular form. Robin Margaret JENSEN (1997) noted that most of the extant examples of baptismal architecture in North Africa dated from the fifth, sixth, and seventh centuries. ‘Some scholars have suggested that certain shapes are characteristic of particular chronological periods, and that font shapes generally progress from square or rectangular to round, hexagonal, cruciform, and finally poly-lobed.’ However, there are notable exceptions to this scheme. Jensen concluded that such a chronological development of font style is hard to establish in North African baptisteries. Fig. 43 – The quatrefoil font in the baptistery at Kélibia in Tunisia, dating from the sixth century, developed from the cruciform font. The font from Kélibia (Northeast Tunisia, near Cap Bon), as described by Jensen, is a perfect example of architecture, in which decorative and symbolic images are inspired by four-fold themes. DAVIES (1962) gave a photo of this font as Plate I in his book (fig. 43). The font is divided into four segments (referring to the four rivers of paradise or the four gospels). The top of the font has a four-part inscription. The first band has four primary images (dove, cross, ark, chalice), the second register also has four central images (small fish beneath a dolphin) and four different trees separate the pictures. The different trees represent the four seasons: date palm (spring), olive (winter), fig (summer) and apple (autumn). The third band consists of white crowns and in the basin of the font is the Christogram with the alpha and omega. 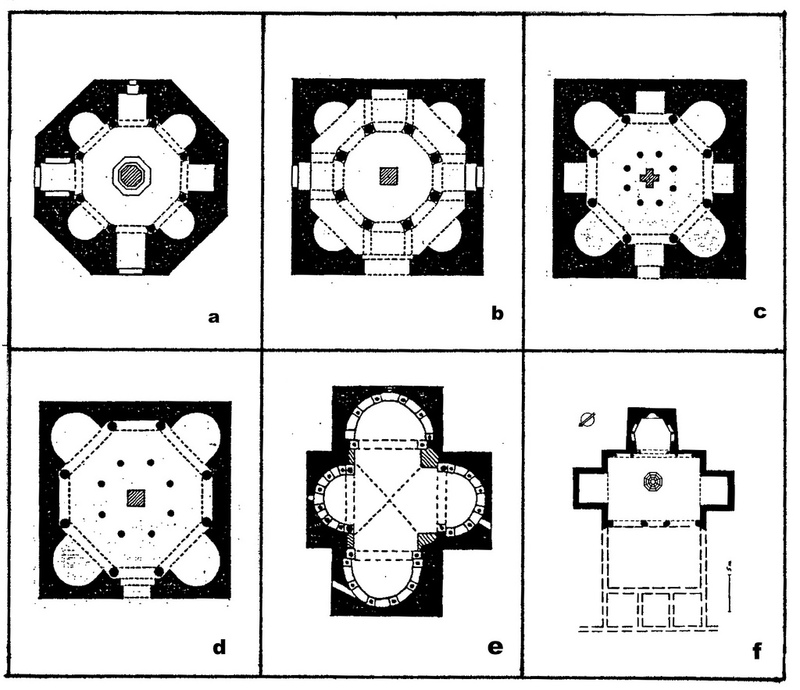 Jean HUBERT (1938) presented – in his book L’Art pre-romain (1938) – a summary of the different baptisteries based on the octagonal ground plan, mainly in France. Most of his examples dated also from the fifth and sixth century (fig. 44). 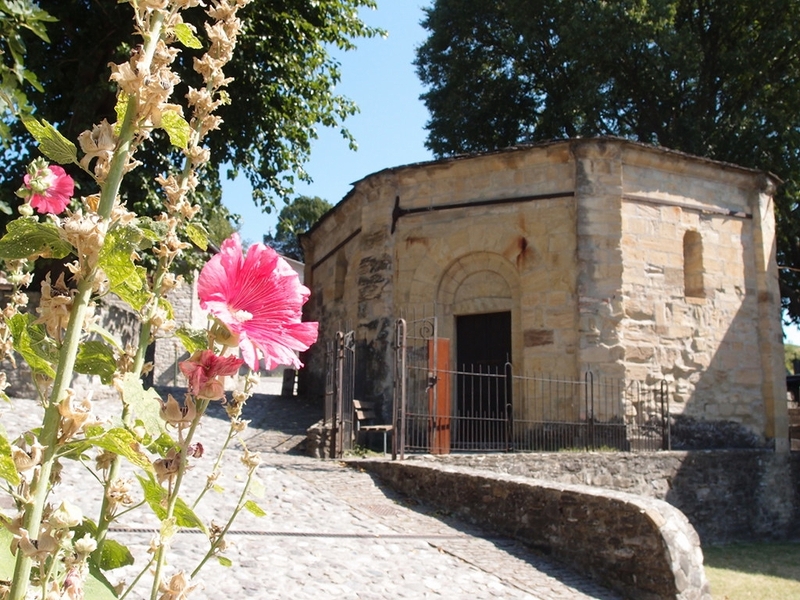 The baptisterium of Frejus was built after 374 AD and is probably one of the oldest Christian sacral buildings in France. Slightly younger, but in the same vicinity (Provence, Southern France) are baptisteries in Albenga (first half of the fifth century) and in ‘one of the most beautiful villages of France’ Venasque (fifth century). The latter building has a quadrilateral shape, just like the baptisterium of Saint-Jean in Poitiers (sixth century), which was visited by the French architect Claude Perrault (1613 – 1688) (BRÖNNER, 1972; p. 51). Fig. 44 – These plans represent an overview of various baptisteries in France with an octagonal or quadrilateral ground plan. They were all built in the early ages of Christianity (fourth to sixth century). A. Albenga; b. Riez; c. Frejus; d. Marseille; e. Venasque; f. Poitiers. The caldarium of the Roman bathes is their pedigree. Wedepohl applied this mental development scheme on the small abbey church of Ottmarsheim (Alsace) (see also p. 316, fig. 252/253). This church had an octagonal core and was a late copy of the Palatine Chapel at Aachen. The adjoining single tower is part of the original abbey building. He emphasized the new spirit, which emerged in the early eleventh century with the Reformatio (of Cluny) and a Renovatio. The church of Ottmarsheim (France) fitted into the competitive building of churches in such places like Bamberg (started in 1004 by Emperor Heinrich II), Strasbourg (1015) and others. Fig. 45 – This scheme by Edgar WEDEPOHL (1967) gives a development of four different types of (mental) forms in a geometrical building. The Urform (I), Grundform (II), Raumform (III) and the Bauform (IV) are illustrated here on the octagonal core of the Ottmarsheim church in the Alsace (France). The famous baptisterium of Florence was built in the middle of the eleventh century. This is about the same time as the central building of Ottmarsheim. The baptistery of Pisa was designed by the architect Dioti Salvi in 1153. Its circular diameter measured thirty-nine meters. The construction was not completed until AD 1278 and Gothic additions were added up to the fourteenth century. Other interesting examples of Italian baptisteries can be found in Biella, Brindisi, Cremona, Galliano (near Milan), Gravedona, Monte Sant’Angelo, Padua, Parma, Pinara, Pistoia, Spalato, Verona and Volterra. All these buildings have their grammar in common. The element of water finds in the geometry a connection with multitude and unity. 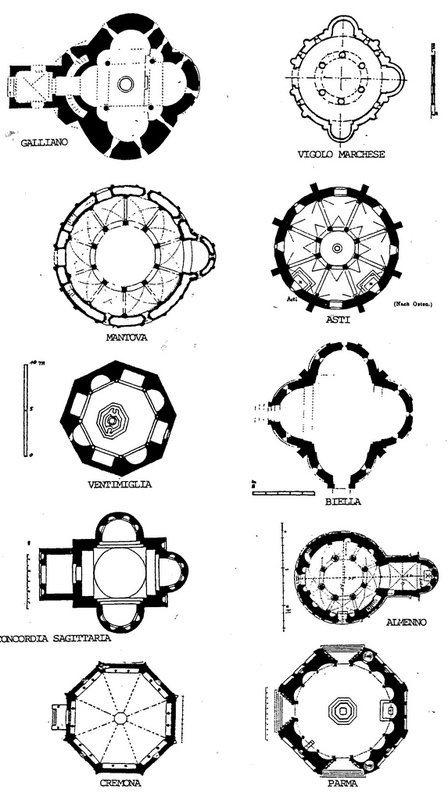 Manuel KLING (2003) described a number of chapels in Northern Italy (fig. 46). They are of the Romanesque age and can be dated between the first half of the tenth century (like Biella) to the middle of the twelfth century. 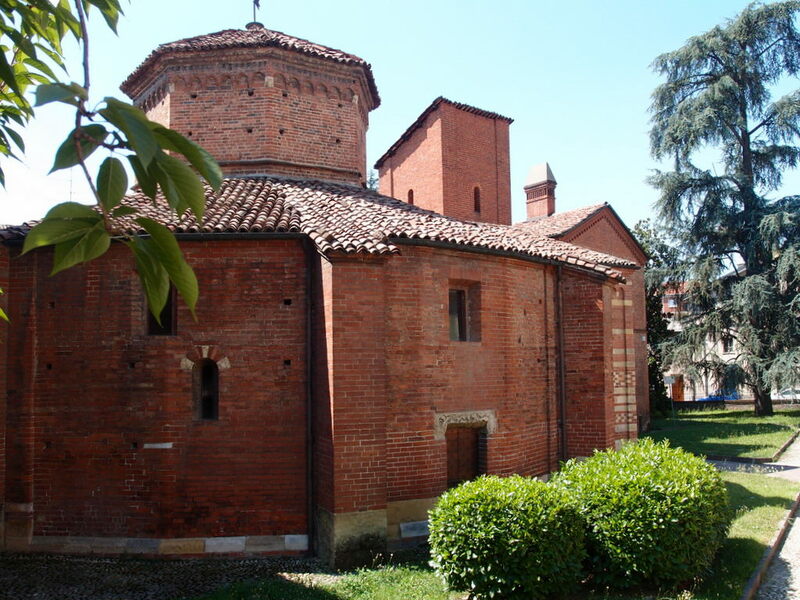 Other baptisteries, like Asti – where the building got it function at the end of the thirteenth century – and Parma, which started in 1196 and acquired its eight small towers some hundred years later, are of a later date. Kling’s selection of (ten) baptisteries in Northern Italy indicated the great variety of outer forms. The buildings have their geometric intentions in common. Fig. 46 – An overview of the ground plans of various baptisteries in Upper Italy, according to Manuel KLING (1988; p. 418). Baptistery in Asti (Italy) (Photo:Marten Kuilman, 2011). Baptistery in Serrevalle (Italy) (Photo: Marten Kuilman, 2011). There are very few circular or polygonal buildings in Italy belonging to the Gothic age. Baptisteries had apparently passed out of fashion, at least in the southern countries around the Mediterranean. The northern island of Gotland (Sweden) saw a thriving activity. The manufacturing of (octagonal) fonts was a major industry here. The fonts were exported to surrounding regions in the Baltic area (Denmark, Sweden and Germany) from the twelfth to the fourteenth century. ‘Nowhere else in western Europe is there such a concentration of richly carved Romanesque fonts in such a reduced geographical area’. DRAKE (2002) gave a recent overview of Romanesque fonts in Northern Europe and Scandinavia with many illustrations. The baptismal fonts are at present subject to a worldwide investigation, as initiated by the University of Toronto (Canada) (Baptisteria Sacra. An Iconographic Index of Baptismal Fonts). The distribution of fonts in place and time might reveal interesting clues with regards to the use of a particular imagery and its associated type of division thinking. The University of Copenhagen (Denmark) contributes to this project by tracking the history of stone carving on the Swedish island of Gotland, which included the manufacturing of fonts. The history of baptisteries, with its devotion to the round, hexagonal and octagonal form, shows that a certain symbolic-numerological intention can survive over a long period of time. It has been known that the ‘original’ octagonal shape was directly derived from the Roman caldarium or ‘cold room’ as part of the Roman bath system. The relation between form and function found its way into the Christian belief in a natural way. The baptisteries became the holy places of the washing (of sins) and turned the original (Roman-pagan) ‘cold room’ into a place of worship. The relative prominence (in Europe and adjacent areas) in the fourth to the six century AD and later in the twelfth and early thirteenth century points to a certain disposition with regards to geometric design. The former period of prominence might have a relation to the visible part of the Fourth Quadrant of the Roman cultural period (125 – 500 AD). It is a common phenomenon, that the emphasis on numbers, and numerology in general, increases towards the end of a cultural cycle. A four-fold mind – with its knowledge of multiple division thinking – often ends up in an attention to numbers the very moment it tries to translate its ideas into reality. The second predominance of geometrical baptisteries was related to the visibility process of Europe-as-a-cultural entity. Its presence was related to the frantic building of churches and cathedrals all over Europe from the beginning of the twelfth century onwards. The search for identity, so powerful initiated some three hundred years earlier by Charlemagne, had to look for examples of the past to measure its own understanding. The geometrical design was just such a point of recognition. It had been present for several ages, but regained a new meaning on the road to visible visibility (of the Third Quadrant, 1200 – 1800). The ‘old’ baptisteries enjoyed a new period of attention. The Baptistery of Florence, probably dating from the eleventh century as a reconstruction of a fifth-century baptistery, became a Gesammtkunstwerk in its own right. Andrea Pisana made the south door of gilded bronze (in 1336). The shape of the tables in the north and south doors of the Baptistery had a strong tetradic undertone with their cadre of a tilted square and four circles. Lorenzo Ghiberti produced the north and east door (in 1427 and 1452). The latter door is known as ‘del Paradiso’, consisting of ten panels with scenes from the Paradise – the originals are now in the Museo dell’ Opera del Duomo’. The mosaics of the baptistery were completed between 1266 and the early fourteenth century by Venetian artists with a Byzantine education. The Italian sculptor Lorenzo Ottoni (1658 – 1736) executed the decorations of the chapel of the Baptisterium and transformed the inside in a magnificent piece of art. The search for identity picked up again after some relative meager years in the late thirteenth and fourteenth century in a cultural movement known as the Renaissance. The geometric design had lost its innocence by that time and became part of a deliberate way of expression. The visibility of a plan gained the overhand over the rather vague intentions and notions of earlier medieval projects. Renaissance architects and artists knew what they were doing, while their illustrious predecessors were just doing their job. The difference seems only slight, but is crucial in terms of judgment. The history of baptisteries continued up to modern times. The detached baptisteries (like many examples in Italy) were abandoned and the font came to be placed within the church itself. Adult baptism was much less practiced and the new candidates for baptism were mainly children. Financial aspects became important and a system of appropriations delayed the universal entrance of the font into the church. The font was often only found in the abbey church. Reformation (in particular Calvinism) and Puritanism (in England) had their influence upon the architectural setting of baptism. Fonts were moved (often to the east end of the church) to make a place for the central setting of the pulpit and the Word of God. Fonts were designed along traditional lines, i.e. a large quatrefoil with stem and square base. The size of the bowl was diminished, since affusion and aspersion became the rule. After the Restoration, the basin was retained in many churches. This limited overview of baptisteries in Europe pointed to a preference of the geometrical design (square, quadrilateral, round, hexagonal or octagonal). The special place and function of the (Christian) baptistery can be traced back to the Roman (pagan) baths, in particular the caldarium, which found in the six- and eight-walled room a symbolic and practical place for togetherness. This continuation of (numerological) symbolism from the Fourth Quadrant of the visibility period of the Roman cultural history into the Second and Third Quadrant of the European cultural history is a good example of the search for identity based on division thinking throughout the ages. The Urform of the eight-fold plan is the result of two squares, moving around a common centre point and are turned over an angle of forty-five degrees. These elements (two four-divisions and a shift) are the very building stones of a quadralectic communication, which consists of two four-division moving along each other in a linear way. The octagonal can be seen as a ‘simplified’ form of a tetradic interaction from one central point, whereas the quadralectic interaction has two central points, belonging to the different contributors of the communication (the Large and Small Part). The sense of eternal (cyclic) movement along lines of a four-division is essential in both types of communications. The element of water – with its affinity to the visible invisibility of the Fourth Quadrant – fits in smoothly within the context of the octagonal symbolism. This mythical bond might explain why the architectural design had such a remarkable perseverance.